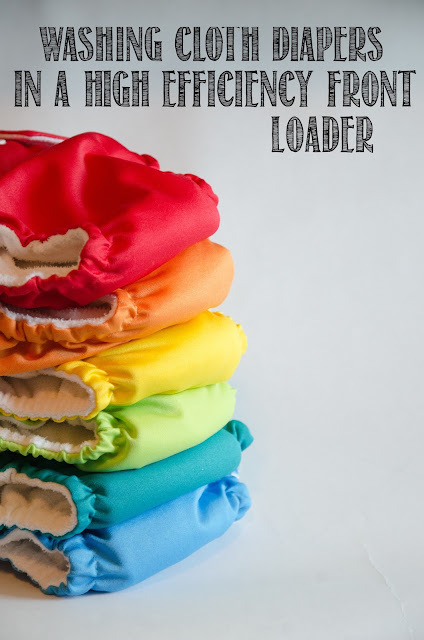 I started cloth diapering while owning a top loader washing machine. The washing procedure in my Cloth Diapering 101 post worked perfectly. Everything was peachy and then...we moved. During the move we decided to upgrade our washer and dryer. There is something so 'adult' about buying a new washer and dryer. We (read: my husband) did the research and we bought a brand new gorgeous front loader high efficiency set. We love it. There was just one problem: we had to figure out a new cloth diaper washing routine. I think I was a little exhausted from the move, so I made this out to be a much bigger deal than it really was. With a little more research (again, husband to the rescue) we have a new procedure to share with you! The main issue with washing cloth diapers in a high efficiency machine is the amount of water used and the absorbency of the diapers and inserts. Diapers don't weigh much so the machine runs with a small amount of water. The absorbent inserts soak up this water, leaving very little for sudsing and the actual washing. Solution: Wet the diapers first. Run a simple prewash or rinse cycle with no detergent prior to washing. A lot of modern machines have a maximum fill setting that can be used to increase the amount of water during the hot wash cycle (with detergent) as well. You will need to use a detergent that is made for HE machines. We have used Country Save and Rockin' Green detergent. Pay attention to the instructions for your detergent regarding how much to use for HE machines. After washing, do a fresh rinse with spin (optional). And that is it. Looking back at my top loader instructions, they look identical. The key differences - using the 'max fill' setting and using the appropriate amount of detergent for HE machines. When ready to wash, first do a prewash cycle with no detergent. Then do a normal hot cycle with detergent. I would use a 'max fill' setting here if available. Add another rinse at the end to get all the soap out. We want our diapers to last through a few kids so we have decided to be extra cautious and air dry the shells and the wet bags. When possible I will dry the shells in the sun to help keep them white. Sunning diapers is a great way to dry them and can help bleach them back to white if you have any discoloration (I have never had any problems). We do machine dry the inserts (with Wool Dryer Balls ). Efficiency is usually rated on a scale of A-G where A is the highest and G is the lowest. Thus a A rated machine will offer maximum efficiency compared to a G rated one which offers the least.